HOW MANY DIVAS CAN ONE STAGE HOLD?! 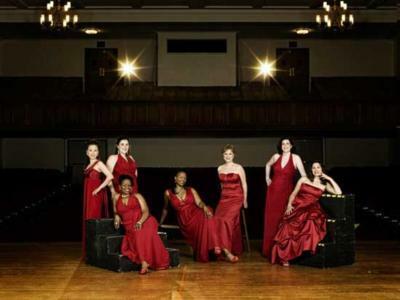 Drawn from comedy, drama, secular and sacred music, seven divas weave together a program of arias and art songs into kaleidoscope of sight and sound. Classical music and opera was composed as the popular music of the day, meant for the masses. Opera in particular reflected contemporary social issues by communicating moral, ethical and everyday life situations in comedic or dramatic form. One might call it the soap opera of the day! The music was fun, not stuffy.
? ?With this in mind, the 7 Soprano's Artistic Director, Cynthia Cole, has used her years of experience and love of classical music to form a unique group called the 7 Sopranos. With each voice possessing its own unique weight, timbre, shimmer, sound, each soprano's personality is captured in these unique musical arrangements. Arias and songs come to life in a new and exciting experience for the audience as well as the 7 Sopranos. Cole describes their performance as "a fast pace, fun filled evening of soprano repertoire from opera, art song and musicals". Seven Divas singing together on one stage! How many Divas can one stage hold?! Please note 7 Sopranos will also travel to Arlington, Falls Church, Oxon Hill, Washington, Springfield, Fort Washington, Mount Vernon, Annandale, Fort Belvoir, Newington, Temple Hills, Suitland, Accokeek, Fairfax, Lorton, Merrifield, Bethesda, Burke, Capital Heights, Capitol Heights, Clinton, District Heights, Dunn Loring, Mc Lean, Brentwood, Bryans Road, Chevy Chase, Mount Rainier, Vienna, Cabin John.